Former U.S. Army Sgt. Ryan McGrath didn’t have a career lined up after a five-year hitch that included a deployment to Iraq. In the military, he specialized in cybersecurity. But the field didn’t excite him. He tried property management, and the car rental business. Still undecided, he went to George Mason University on the GI Bill and earned a bachelor’s degree. Ryan applied and was accepted to the program administered by Veterans Florida in partnership with Hillsborough County and the University of Florida/Institute of Food and Agricultural Sciences (UF/IFAS). He began in October. Upon completion, he’ll work an additional three months in an agricultural area that interests him. The Veterans Agriculture Selection Program (VASP) launched three years ago in Hillsborough County, at the Gulf Coast Research and Education Center in Balm. GCREC is one of 11 such centers run by UF/IFAS. The program is catching on. There’s one in Quincy, and centers in Apopka, Homestead, and Ona are establishing VASP internships. VASP is based on the belief that the discipline, determination, hard work, and other characteristics of military men and women transition well to careers in agriculture. It’s different from programs in other states that focus exclusively on training veterans to become farmers. VASP offers an array of experiences in agricultural disciplines. It also pays participants, though the compensation is modest and no benefits are included. 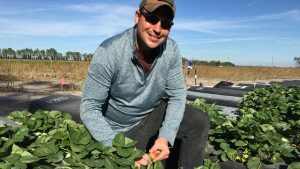 Supporting VASP at the Balm facility is one of the ways Hillsborough County is encouraging military veterans to consider careers in agriculture. On Jan. 18, about three dozen active service members, veterans, and their spouses climbed aboard a bus to tour local agricultural operations. It was the fifth year Economic Development has organized the free Military Agriculture Tour. One of the tour stops is the Gulf Coast Research and Education Center. This year, participants met Ryan and some of his colleagues. Ryan says he’d eventually like to own a pest control firm that focuses on commercial agriculture. He says a military mindset – everyone coming together to get the mission done – is hugely beneficial.